If this is the case, then why am I writing an article on how David Stern whitewashed the NBA? His efforts were typical of a commissioner, who has always seemed eager to be viewed as some kind of modern plantation overseer treating NBA men as if they were his boys. It’s part of Stern’s M.O. Like his past self-serving edicts on dress code or the questioning of officials, his moves are intended to do little more than show how he’s the one keeping the hired hands in their place. Some will, of course, cringe at that characterization, but Stern’s disdain for the players is as palpable and pathetic as his motives are transparent. For me, David Stern’s treatment of players will be his lasting legacy. Stern adopted authoritarian policies and issued heavy-handed punishments in order to restore the league’s image. He endeavored to make the NBA more palatable to national and international audiences. Through his draconian tactics, Stern purged certain Black players from the league, and as the NBA’s influence grew, he replaced those players with a new demographic of international players. Thus, Stern’s tenure was about image and profitability; even the league’s diversity initiatives are driven by such motives. Throughout the 1980s and ‘90s, Stern made some landmark decisions that showed the NBA was trying to strip itself from a reputation of being “too Black.” Stern began administering lifelong bans on players with multiple drug offenses. This system of punishment eerily resembled the three-strikes or repeat offender laws which were becoming popular in society. For example, Roy Tarpley and Richard Dumas received lifetime bans after their third offenses (both players’ third offenses were drinking alcohol). While several players who received the NBA’s capital punishment were eventually reinstated, Tarpley and Dumas were among those who were not. Whitlock’s contention is supported by the reality that Stern’s harsh punishments weren’t limited to lifetime bans. In 1997, the NBA suspended Latrell Sprewell for 82 games (it was later reduced to 68 games by an arbitrator) after his run-in with Golden State coach P.J. Carlesimo. Sprewell allegedly attacked and choked Carlesimo after a disagreement in practice. Stern called the incident a symbol of the “widening gulf” between NBA players and fans. The case contained clear racial undertones. Even Sprewell maintained that if he was white, the media would have portrayed the situation differently. And he was likely right; white players and team officials were involved in similar incidents around that time but were never punished by the league. Meanwhile, Sprewell was out 68 games, which cost him over $6 million in salary. In 2004, perhaps the most infamous brawl in sports history occurred at Detroit’s arena when a white fan threw his beer at the Indiana Pacers’ Metta World Peace (then known as Ron Artest), causing World Peace to jump into the stands and confront him. As a result, World Peace was suspended for 86 total games and lost about $5 million in salary. This was a case that stemmed from a white fan’s hostility against a Black player. The initial racism by the instigating fan and the racist public reaction to the ordeal only fueled Stern’s response, leading to the season-long ban for World Peace and substantial suspensions for teammates who backed him up during the fracas. Because these events sparked racially charged public relations nightmares for the NBA, Stern expedited his image-driven racial purge by moving to eliminate the perception that the NBA was “too Black.” The lifelong bans and lengthy suspensions were proof that Stern was cracking down on players who he felt were damaging the NBA’s reputation. The league’s current “NBA Cares” marketing campaign validates that proof. The “NBA Cares” is basically a “we’re not thugs” promotion, in which the league shows how players are “good citizens” who are actively involved in their communities. At least one “NBA Cares” commercial airs during every nationally televised game to reinforce the notion and build the image that NBA players are good people. This is why Stern said “the NBA cares” when reflecting on the league’s image overhaul. Today, players navigate within the confines of the dress code by donning their own unique styles. 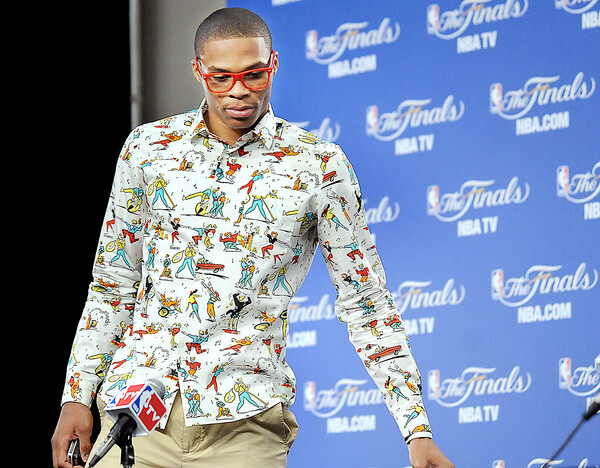 Guys like Russell Westbrook and Dwyane Wade are known for their flamboyant fashion senses. Consequently, the media frames the dress code as a great triumph for Stern. In a recent New York Times article, new commissioner Silver said about the dress code: “There was some resistance initially, but I think the players understood why we collectively thought it was necessary and they bought into it and have had fun with it by letting their unique personalities come out through their wardrobes.” The article lauded Stern’s implementation of the dress code as “the marketing equivalent to slam dunking the game-winner at the buzzer.” Nonetheless, players are exercising their fashion freedom in spite of Stern, not because of him. Stern’s increasingly authoritarian measures are influenced by broader government initiatives that have debilitated Black communities. The harsh suspensions that he levied against players like Sprewell and World Peace came off as cold retribution for damaging the league’s reputation. In this sense, Stern’s rule over the NBA seemed almost like a dictatorship. At the same time the NBA was adopting more stringent policies, basketball was becoming a global game. Globalization provided the NBA with a huge opportunity to expand its market. The NBA’s footprint spread to Europe, South America and more recently, Africa and Asia, which led to an influx of international (mostly European) players. This season’s opening-night rosters consisted of a record 92 international players from 39 countries and territories. In 2005, the league imposed an age limit, which resulted both from globalization and the belief that too many American players were declaring straight out of high school. The new rules stated that a prospect must be at least 19-years-old to be eligible for the NBA draft. Additionally, U.S. players must be one year removed from high school graduation. This is important because it reveals an implicit bias in the draft eligibility requirements. Players defined as “international” have no restrictions stemming from schooling. Hence, the NBA’s amended draft rules advantage international players and conversely, hinder (mostly Black) American prospects. The Nobel Peace Prize Winner? Through such tactics, Stern gradually whitewashed the NBA. The league continues to embrace diversity, but its diversity initiatives actually contribute to the racial purge. For league executives, increasing diversity means integrating more Europeans and other internationals by weeding out Black American players. The stiff bans and the biased age limit help accomplish this global scheme. Some may argue that the league’s projects advance competition; however, having different standards for international players gives them competitive advantages over those coming from U.S. high schools. Most importantly though, the whitewashing is about drawing fans and securing markets that make the NBA a more profitable brand. As such, Stern’s racially loaded punitive policies (the dress code, suspensions, etc.) actually help the league’s brand. Racism sells. I will remember the David Stern era as a dictatorship. The lifelong bans, the ridiculously harsh suspensions, the racialized dress code and age restrictions, and the “we’re not thugs” ad campaign show that his quest to restore the league’s image was accomplished by purging out certain players. Stern single-handedly transformed the NBA into a police state, a precedent that was followed by other American sports leagues. So maybe he does deserve a Nobel Peace Prize. He wouldn’t be the first authoritarian figure to win one.